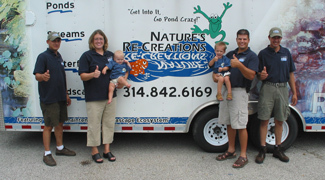 Nature's Re-Creations, LLC is a family-owned enterprise specializing in the design and construction of custom outdoor water features that enhance our customers' quality of life. Our passion is the creation of natural looking and ecologically friendly ponds and waterfalls. The inspiration for our designs comes from experience and the desire to re-create the beauty of nature in a not-so-natural environment. Owner, Chris Siewing, is extremely experienced in the horticulture, landscape and construction industries. Having started Greenview Landscaping, LLC in 1996, Chris transitioned the business into Nature’s Re-Creations in 2003 and has grown it into what it is today. Our staff members are experienced horticulturalists and have extensive education and experience in landscape design and construction, giving Nature's Re-Creations the knowledge and ability to create your backyard paradise. We believe that the key to success is how we treat our customers. As a service-oriented business, we know the value of quality work. That is why we prides ourselves in instilling these values into each and every one of our employees. By fostering this passion, creativity and service-driven attitude among our staff, we help ensure that there is no compromise of quality, design, professionalism or delivery. Our employees share this passion together and work to achieve the highest level of quality and service. Our artistic, natural design and installation techniques as well as our 100% commitment to customer service and satisfaction sets us apart from all our competitors. Our unique style and ability to create truly natural looking features is unmatched in the industry. All we do is water features, we are not just landscapers who dabble in ponds, Nature's Re-Creations truly specializes in naturalistic water features. At Nature's Re-Creations, we pride ourselves on being the most educated contractor of water features in the St. Louis area. By attending extensive education and training seminars on a regular basis – hosted by Aquascape Designs, the industry leader and world's largest water gardening manufacturer – our goal is to keep current in today's trends and styles. Our education, experience, and many industry awards and certifications set us apart from everyone else in the area. Through many years of experience, our team at Nature's Re-Creations has refined our style and technique to be the best at creating the most natural looking, environmentally friendly water features around, so let us prove it to you. Our crew can construct anything from a small backyard koi pond to a commercial-scale water feature, or even add a beautiful waterfall or wetland filter onto your favorite lakeside retreat. Call us today at (636) 223-2330 with any sized project you have in mind.